In the world of large bore revolver shooting, few rounds have a reputation for sheer stopping power that the .44 Magnum has come to earn since its original inception in 1955. 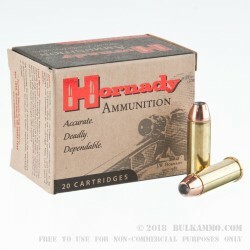 With the introduction of the Hornady 300gr .44 Magnum Extreme Terminal Performance Jacketed Hollow Point ammo, that reputation continues to stand unchallenged in world of large bore revolvers today. Hornady Extreme Terminal Performance (XTP) ammunition is renowned for its deep, controlled expansion even at subsonic velocities over an extended range. 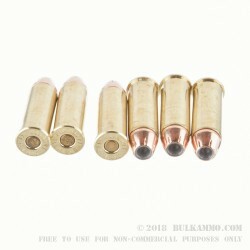 A gilded full metal copper jacket protects the hollow point cavity, and ensures a deep penetration without premature expansion. The swaged lead core ensures total uniformity in the bullets weights distribution inn order to guarantee an upallred degree of accuracy in flight, and the revolving cannelure around the bullets shank eliminates any and all distortion of the finished bullet. 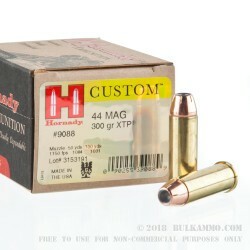 Hunters looking for a merger of high quality components engineered by a brand that they can trust, will find solace in the Hornady 300gr .44 Magnum Extreme Terminal Performance Jacketed Hollow Point. My, oh, my. I took my .44 mag out to shoot for the first time. 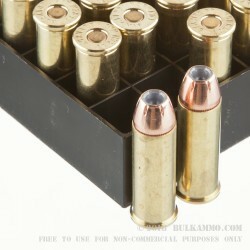 I was on the range and brought blazer 240gr, fiocchi 240gr, and a few rounds of this. Compared to the others, this stuff is noticably louder and has one hell of a kick. After 3 consecutive rounds, my wrists hurt. It was fun, I was laughing, but damn it's hard. I'm saving the rest for a future hunting trip. Kind of excited to take an animal with a handgun.